Somsak Kaoponlek the former Lumpini stadium champion and Contender Asia Qualifier for the now cancelled Contender Asia Season 2 returns. More recently Kaoponlek is noted for his fights with notable France Thaiboxing talent Fabio Pinca, who won this year’s Thai Fight tournament held recently. Kaoponlek won their first encounter in 2007 by decision. Ironically the two are also scheduled to meet this month at Thai Boxe Mania 2011. This time Kaoponlek will face off against Elias Aharram of France. Elias Aharram recently won in a WKN Belgium fight by a 2nd round KO. Aharram fights out of Team Domingos in France. Karim Souda VS Mike Schmidt at 72.5 kg. 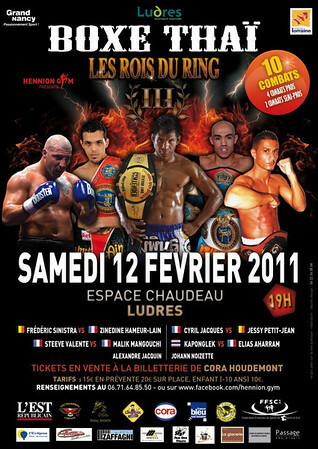 Also an additional fight has been added with Kevin Goubernator (Hennion-gym) vs. Delf (Strasbourgteam). More fights are still being made for the February 12th card. The action begins at Espace Chadeau in Ludres, France. Tickets presumably will go on sale this month for the event. ~ by fatsoking on January 5, 2011.